Well, I tried. As with so many Popper pieces, the manuscript seems not to have survived. Over the years, I spoke to two members of Popper's family, one being his grandniece Dr Lore Armaleo Popper, and both said that all his surviving belongings were destroyed during World War II. The first edition has Popper's own fingerings and bowings, so doing one cello part exactly like this seemed obvious. With this sort of music, it is clear that his own markings reflect not only his personal style, but also the taste of the time as well as the instrumental technique and setup (gut strings, not as loud a piano as today etc). When it comes to editing such things nowadays, I believe that there is only two options: Either leave the original completely untouched which is the only way an Urtext edition should be. Or one does a practical edition for nowadays' performers which naturally again reflects personal and contemporary taste and style. 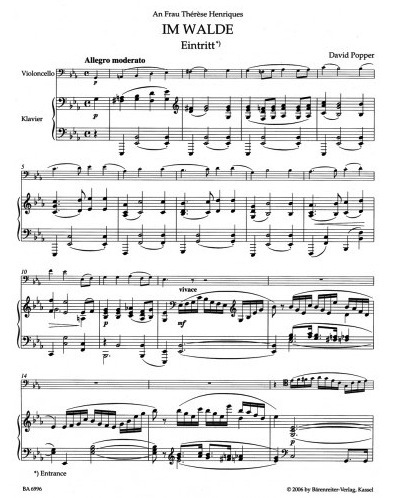 The best way with most music in my view is either a true Urtext edition or an edition that offers both so that the player can decide what to follow. Why I do not believe this for etudes you can read on this website under the entry of Popper's "High School of Violoncello Playing" op 73. 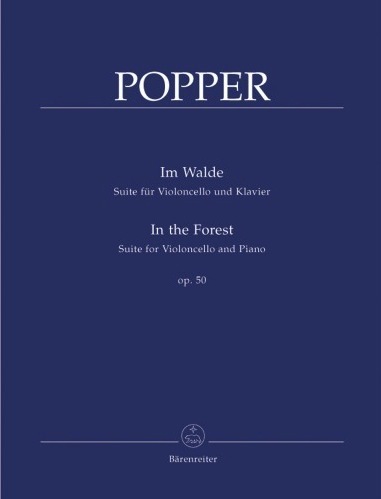 "Im Walde" is a masterpiece I think. I have played it many times and audiences always love it, especially in recitals that have otherwise "heavy" music. This is light yet sophisticated music, charming and emotional. The cello part is fantastically well written and also the version with orchestra is highly effective. It shows that the composer of the "New Testament of cello playing", the op 73 etudes, was first and foremost a great musician.